Stems: Erect or prostrate, slender, usually branched at base. Leaves: Alternate, simple, somewhat fleshy, numerous on lower portion of plant, scattered above, linear to linear-lanceolate, 2/5 to 4/5 inch long, glabrous; margins entire; tips pointed. Flowers: Blooming first on lower portion of plant then advancing toward tip; sepals 5, overlapping, less than 3/16 inch long, entire; corollas about 3/4 inch wide, blue to pale bluish white; petals 5, 1/4 to 1/2 inch long; stamens 5, united at bases; styles 5, distinct. Fruits: Capsules, egg-shaped, separating into 10 segments; seeds flat, shiny. 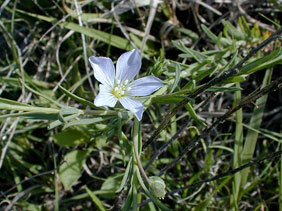 Habitat: Dry, open prairies, roadsides, and pastures on sandy or rocky limestone or chalk soils. Comments: The petals will drop off easily in very hot weather or when disturbed.